Description: We offer beautiful areas to ride under large moss covered live oak trees and an secluded beach area. 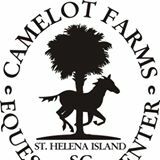 We're a full service equestrian center. We offer boarding, riding lessons, horse training. Guided trail rides on property and to river/sound beach.